I’ll make no secret about it, I ruddy love Christmas. I especially love a good Christmas film! Settling in with more snacks than should be consumable in such a span of time, chugging hot chocolate, and generally radiating festiveness. Finding fresh things to be done with the humble Christmas film can be a tough business, and one that can be like walking a tightrope of tone. My favourite blend has to be in the sweet and sour mix of Christmas and Horror. You take something that should usually be warm and hopeful and severely stir the pot and as an audience member you can’t help but feel completely lost with where it will take you next. “Better Watch Out” takes this concept and has a blast with it. Written by Zack Kahn, who, despite being a relative newcomer to feature film scripts, is definitely someone to keep an eye on. In the same boat is director Chris Peckover, with one previous horror under his belt (2010’s “Undocumented”) lending the film a freshness that really works in its favour. 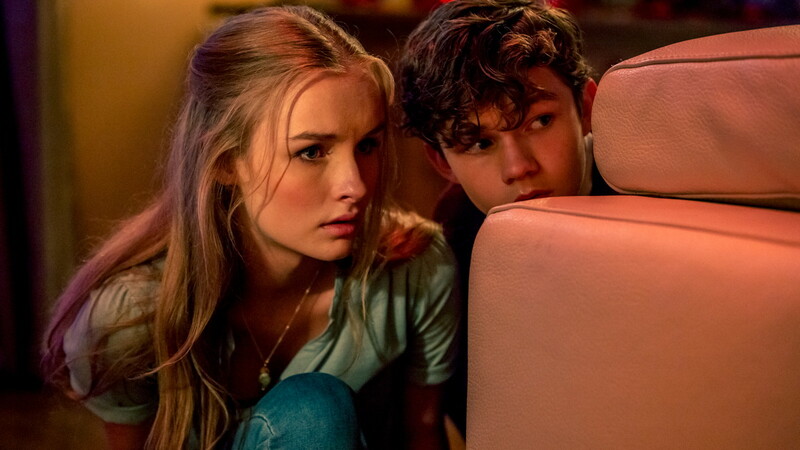 Ashley (Olivia DeJonge) is set to do one last babysitting gig for the Lerner family and the mollycoddled Luke (Levi Miller) before she heads off to college. To say more than that they get caught up in a home invasion would give away what has honestly been one of the more surprising films of the year. It may sound click-baity but it is honestly worth seeing this film cold and just going with it. I won’t end the review there though. Can you imagine? What I will do is talk about the aspects of the film that have stuck with me long after the credits rolled. One of the biggest successes of “Better Watch Out” are the performances that Peckover gets from his (largely young) cast. No one puts a foot wrong here with particular highlights needing to go to Levi Miller. You may remember him from his turn as “Peter Pan” in the critically panned…err…Pan. That being said he was one of the best things in that movie and shows here that the intervening years have given him a surprising range and maturity that reminded me of a young Di Caprio. Given he continues to pick smart roles, his could be a name we see a lot of in future. Each character is given their own idiosyncrasies that ensure that everyone involved is given ways to play with the dialogue in fresh and exciting ways. In fact; it’s these idiosyncrasies that allow the cast to subvert cliché and keep you guessing along with everything the direction is doing. I was endlessly surprised by the places the film would go as the home invasion progressed and just how uncomfortable it could get. Peckover’s direction allows for the tension to ramp throughout and he cashes that in to create well-earned scares and violence that doesn’t need to lean on explicit gore. It’s true that what remains unseen and imagined can be far more effective than the see-all approach of lesser directors. Once the film’s key rug is pulled Peckover spends the remainder of its 90-minute run time to use the setting as a tension filled playhouse. The pacing is truly superb and darts towards the finish line with a steely focus. Better watch out is in Cinemas December 8th! Next Post Tokyo Ghoul out Tomorrow!